Public versions of the presentations from the final project workshop may be found here. 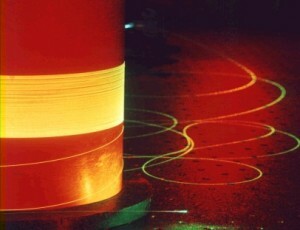 Industrial lasers are used in the fabrication of a huge variety of everyday items. The powerful, focussed beam of light they produce is used, for example, to slice through metal, mark serial numbers onto surfaces, etch energy producing solar panels, and quickly and accurately cut out plastic components. The device you are reading this on was made with the help of lasers. ISLA is a research and development project with a key aim to push forwards the boundaries of current laser material processing technology. It is taking current components, which operate at a wavelength of 1µm (one millionth of a meter), and developing them to operate at double this wavelength, 2µm. By doing this, the power of the system can be increased by around ten times. Until now, materials processing applications have used the 1µm components as they had already been adopted and developed by the telecommunications industry, used for sending data over long distance fibre optic cables such as those used by the Internet. In order to move forwards to 2µm, a series of inter-dependant components have to be developed, including lasers (which create the light), glass fibres (which guide the light) and Q switches/mode lockers (which split a continual light source into a series of intense pulses). ISLA has taken on this challenge, bringing together the best in European engineering organisations and supported by the EU Commission under the Framework 7 funding mechanism to deliver new systems over a period of three years. ISLA is an FP7 project supported by the European Commission. The project will run from 01-Oct-2011 until 30-Sep-2014. This short video provides an overview of the project. This website aims to provide information on the project, its aims, progress and the partners involved. As the project progresses, news items will be published. You can choose to be advised via email when these items are published, using the subscription field to the top right of this page. For more information on the project, please contact Dr Bruce Napier at bruce@vividcomponents.co.uk.